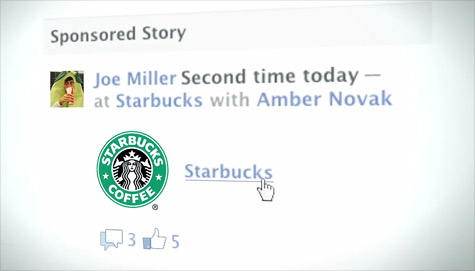 When Facebook launched a new form of advertising called “Sponsored Stories” earlier this year, some folks weren’t buying the plot. The new ad unit, which takes content generated by Facebook users and turns it into ads, seemed to be crossing some kind of line. Six months later, it looks like Facebook actually might have hit upon a powerful new form of advertising. The ads, which grab actions users perform on the Facebook platform (like Liking a brand page or checking in to a restaurant) and turn that into an ad that gets displayed only to the user’s friends, are in fact amplifying word of mouth. According to Vice President of Advertising and Global Operations David Fischer, the units, which cost the same as standard Facebook ads, are performing, on average, twice as well. “The key reasons it works is that it is engaging, it is social, and it is reflective of what brings people to Facebook overall, which is to share and connect,” Fischer tells Fast Company. As for users, Fischer says, they aren’t complaining. Fischer declines to reveal how many advertisers have made use of Sponsored Stories so far, nor how many campaigns had been run through it, saying Facebook doesn’t share numbers related to advertising. That fits with what we hear from marketers, too. “There’s something to be said for implied endorsement,” Michael Wiley, global head of social marketing at VivaKi, says. Fischer tells us to expect more innovation along these lines going forward. Facebook ad and product teams are working on ways to make ads more social, and the company is putting an emphasis on developing new ad products that speak to Facebook’s core mission, that of enabling people to share things with their friends.